The Society has a resident membership approaching 350, representing the majority of the households in the village. It has intervened only in planning applications which are considered to affect the village as a whole, for example the creation of a new road into the village. The Society raises funds from village events for the benefit of local causes such as the Church, the Memorial Hall, and the refurbishment of the viewing platform on the Hard. The Society has an on-going range of social events that bring the community together as well as raising funds to help improve the village. The optional position of President has been removed. The position of Membership Secretary has been moved from Executive to Officer status. The Honorary membership has been redefined. As the Honorary membership has been redefined an additional category of non-voting members to allow those outside the Parish to take part in Society events and functions. The layout and format have been updated. The new 2018 Rules of Association will be found under Joining and Rules. On Friday 2nd June veterans and residents gathered outside the Harbour office to lay a wreath for those from the 601 LCM Flotilla, who lost their lives at sea. Ninety two year old midshipman Geoff Ensor of the 602 LCM Flotilla travelled all the way down from Wolverhampton to remember his comrades who helped carry crucial supplies during the Second World War and departed from Itchenor on the eve of D-Day. 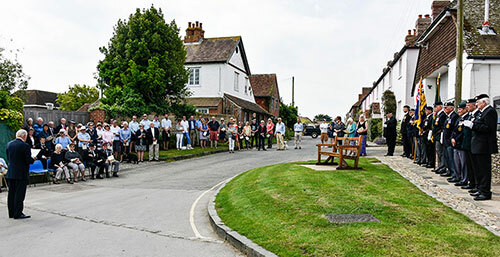 This year the welcome address was given by Peter Dean a past Chairman of The Itchenor Society, the History of the Bench was read by Richard Craven Harbour Master and Director of Chichester Harbour, Capt. Johnny Talbot read the list of names of those who perished at sea, Mrs Alexandra Webb Chairman of The Itchenor Society laid the wreath and Revd Stephen Davies officiated at the service. 1. It was agreed that, with immediate effect, the Agenda and summary of resolutions from each meeting would be published on The Itchenor Society website,. 4. The Secretary has received a communication from Historic England regarding an application to issue a Certificate of Immunity for Old Haven. The Itchenor Society in consultation with the Parish Council will be responding in due course. 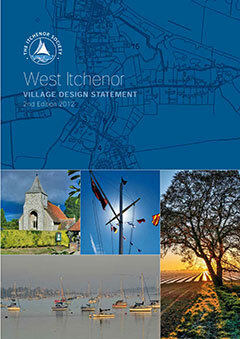 The new Village Design Statement has just been published, printed copies will be distributed to all households in Itchenor, hopefully in about 2 to 3 weeks time. You can download your copy by clicking here! Click here to read the Heritage Asset Assessment of Old Haven.